Of all the miracle soups out there, this recipe for the Best Cabbage Soup is crunchy, savory, and never, ever bland. It’s a perfect post-holiday meal, full of complex flavors and surprising textures, and seriously good for you. And the pickle juice is like magic! These days, you can’t turn the corner without running into a cabbage soup diet recipe that promises the world. This recipe for Russian cabbage soup was given to me by an old friend, and I’ve been making it for my family ever since. 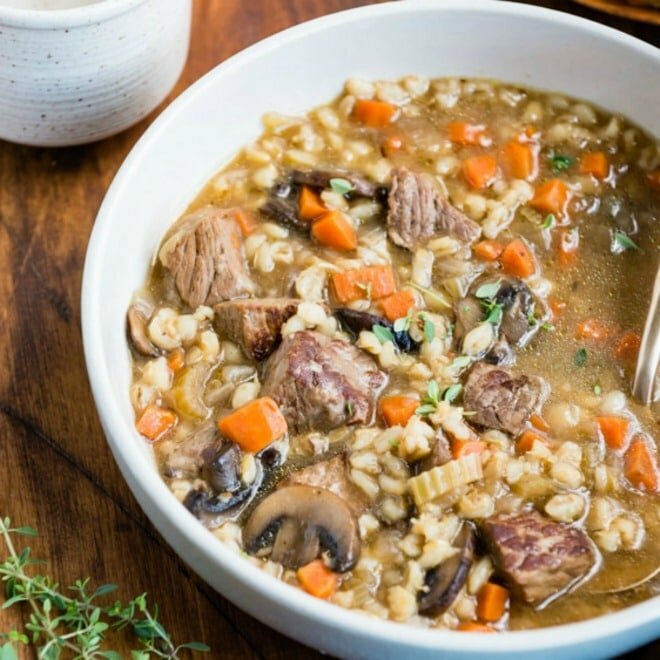 I can’t guarantee weight loss results, but I can tell you that everyone loves this soup. And no one feels guilty afterwards. 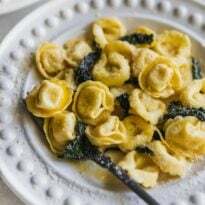 It’s simple enough to make in under an hour, can be made with very inexpensive ingredients, and is a fabulous way to eat all your vegetables. It’s finished with lots of fresh dill and a dollop of sour cream or Greek yogurt. 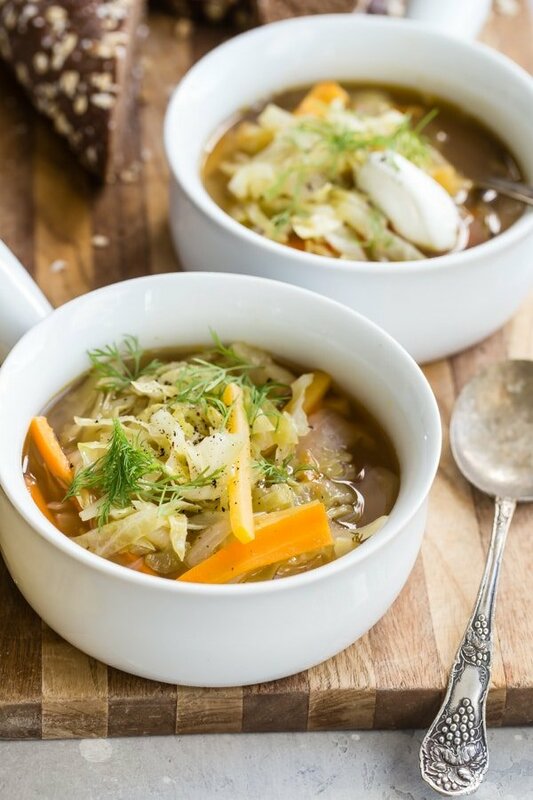 If you’re thinking about a cabbage soup cleanse, needing a hearty, inexpensive dinner on rent day, or just looking for a good homemade vegetable soup recipe, you probably can’t find a better version of cabbage soup than this one. Thinking about freezing portions of soup to enjoy throughout the week? Click and slide the number next to “servings” on the recipe card below to adjust the ingredients to match how many you’re feeding—the recipe does the math for you, it’s that easy. What are cabbage soup ingredients? I learned how to make cabbage soup with vegetable broth or beef broth, but chicken stock works, too. What else? 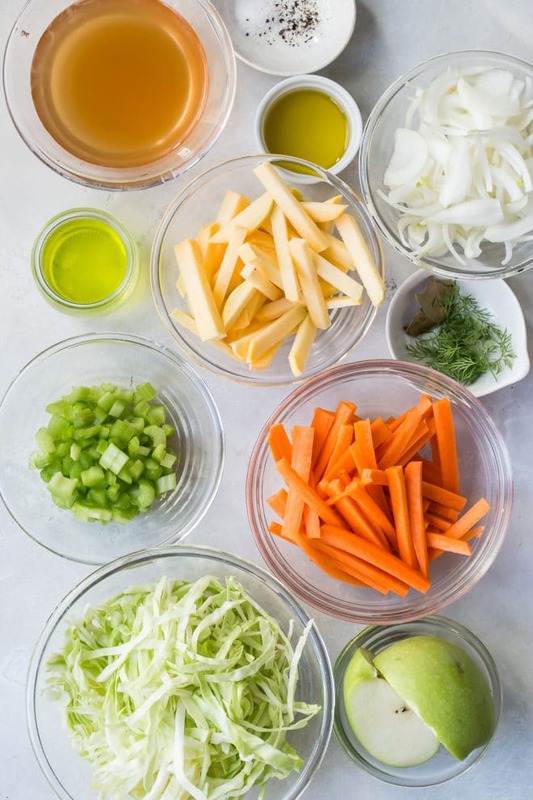 Shredded green cabbage, a crisp green apple, turnip, onion, carrots, celery, and a couple bay leaves. 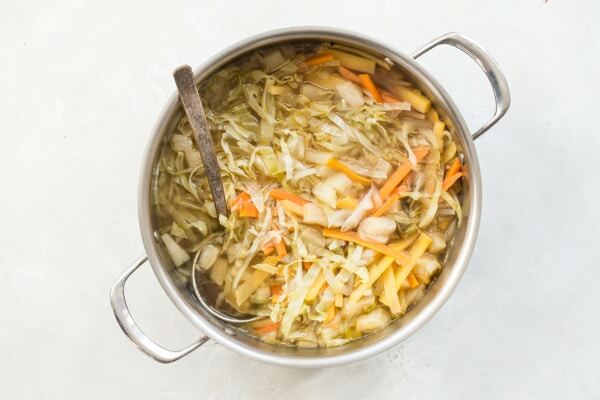 The secret in this simple cabbage soup is a little pickle juice from a jar in the refrigerator (although lemon juice works, too). It brightens up the soup and makes it sparkle. I throw in lots of fresh dill towards the end, and serve the soup with a dollop or two of sour cream, for a creamy cabbage soup. The sour cream isn’t crucial, but it’s so, so good! There are so many people out there who swear by cabbage soup for dieting, or make a giant vat of cabbage soup for weight loss. “Wonder soup” probably works for several reasons. First of all, broth-based soup is hydrating and filling. It’s also jam-packed with good-for-you vegetables, which translates into vitamins, minerals, and fiber. Eating more vegetables is always a good idea, no matter who you are. Furthermore, this soup is so low in calories and carbs. Even if all you’re doing is trying to limit your CICO (calories in vs. calories out), a big bowl of cabbage soup instead of that crispy fried chicken sandwich is where it’s at. 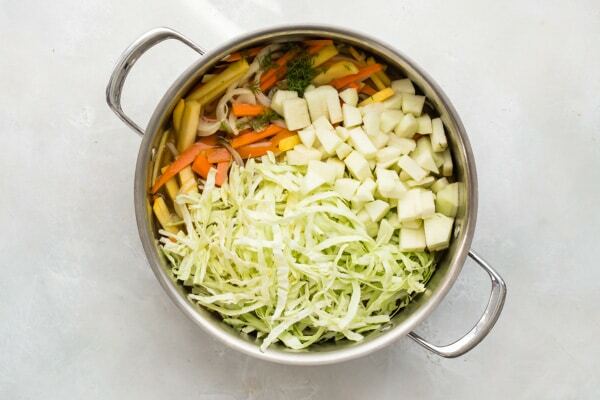 For calories in the Best Cabbage Soup, see below the recipe for details. 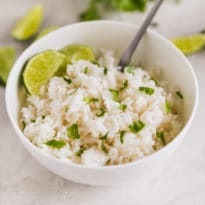 One bowl comes in at about 125 calories, without the sour cream. 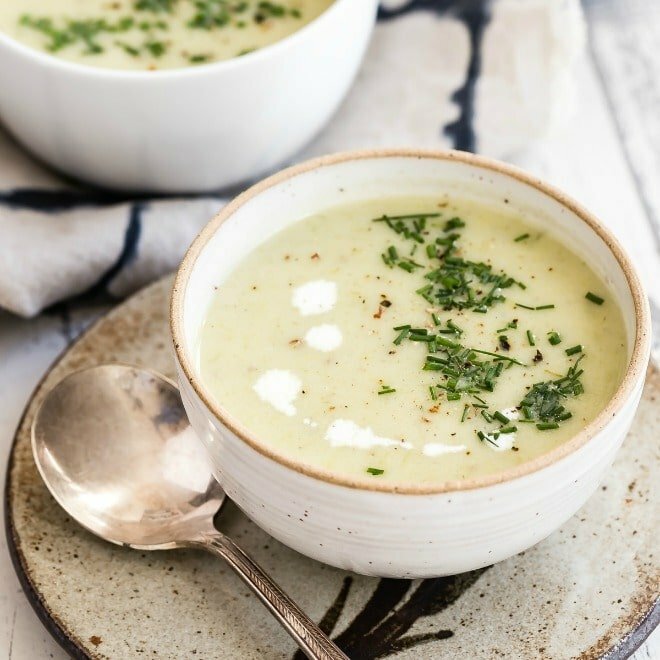 Technically speaking, you certainly don’t need an Instant Pot to make this soup. Since it cooks really quickly on the stove, a big Dutch oven works fine. Here are pressure cooker instructions, though, just in case. Add oil to the Instant Pot and turn it on the ‘sauté’ function. Add carrots, celery, and onion and sauté 5 minutes until softened. Add cabbage, apple, turnip, bay leaves and broth, then stir to combine. Set the Instant Pot to ‘soup’ function for 20 minutes. After 20 minutes, turn the valve to instant release. After pressure has released, open and stir. Add in the pickle juice and dill, then season to taste with salt and pepper. Add celery, cabbage, carrot, bay leaves, onions, broth, turnip to the crock pot. Cover and cook on LOW for about 7 to 9 hours, or until the vegetables are tender. Add pickle juice, apple, and dill, then cook for another 5 minutes. Then all you have to do is season to taste with salt and pepper. Cabbage Soup with sausage: Since this recipe is originally from the Ukraine, it’s completely appropriate to make cabbage soup with kielbasa or Polish sausage. Simply brown the sausages in advance, then add the links to the soup to simmer with the vegetables. Serve whole or cut up into bites in the soup. 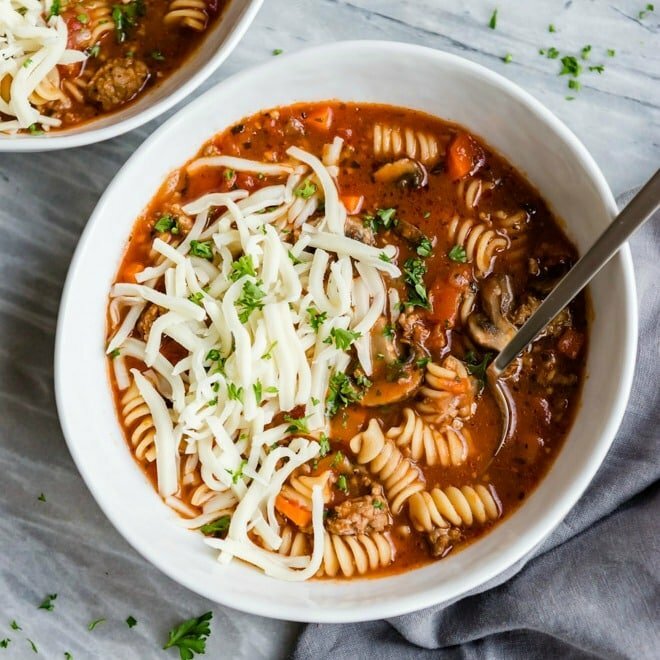 Cabbage Soup with ground beef: Browned ground beef adds flavor and protein to this soup, and turns it into something more like cabbage roll soup. Cabbage Soup with pork: Other smoked pork works well in cabbage soup, too, especially with the sweetness of the apple and turnip. Think ham bone, a pork shank or hock, whatever ya got. Cabbage Soup chicken: Cabbage soup with chicken is delicious. Use chicken stock and add poached shredded chicken when you’re feeling under the weather. 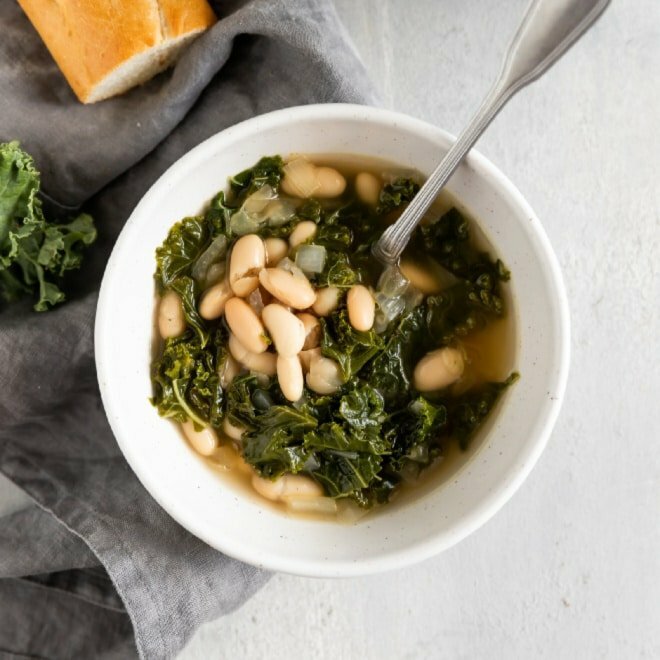 Cabbage Soup with beans: Throw in some pre-cooked beans, or a cup of lentils to cook in with the broth for a healthy vegetarian protein with delicious texture. Cabbage Soup with vegetables: Some cooks like adding some chopped tomatoes or shredded beets to cabbage soup. The more vegetables, the merrier! 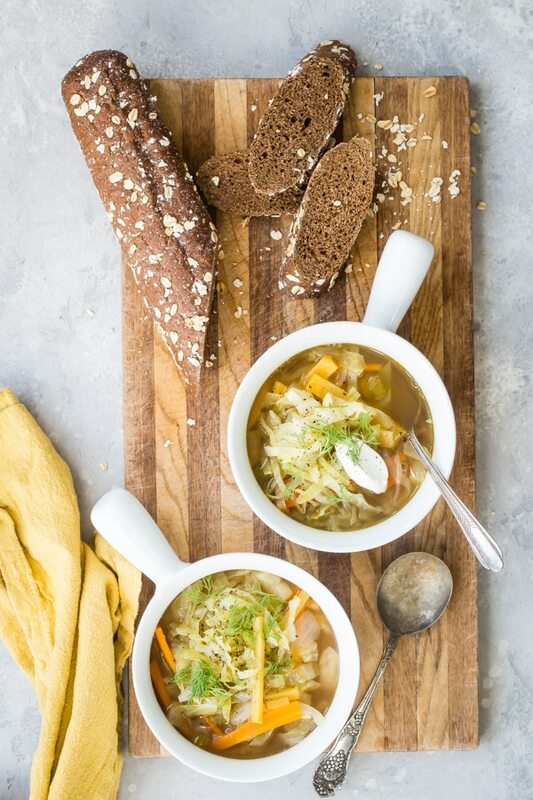 Cabbage Soup recipe, vegan: If you make this recipe with vegetable stock and omit the sour cream, it’s perfectly, deliciously vegan all on its own, or with a plant-or nut-based sour cream. Cabbage Soup recipe, vegetarian: This soup is already a glorious vegetarian soup when made with vegetable broth. Of all the miracle soups out there, this recipe for the Best Cabbage Soup is crunchy, savory, and never, ever bland. It’s a perfect post-holiday meal, full of complex flavors and surprising textures, and seriously good for you. In a large stock pot or Dutch oven, heat the oil over medium-high heat until shimmering. Add turnip, carrot, onion, and celery, and cook until softened, about 10 minutes. Add broth, cabbage, apple, bay leaves, and 1 teaspoon dill. Bring to a boil. Cover and reduce heat; simmer until vegetables are tender, about 30 to 40 minutes. Remove bay leaves and stir in pickle or lemon juice. Season to taste with salt and pepper. Garnish with sour cream and more fresh dill if desired.